I have been duck hunting 42 years. Saturday the duck Gods smiled on me with the shooting of a Mottled duck with a transmitter on its back and a band on the leg, a first for me. This gal I suspect is the one who dug out my dirt hole from behind yesterday morning. Rebaited and put a log backing rather than the grass clump. I looked up and saw what looked like 50 or so huge geese flying away from me 1/4 mile or more away from me. They looked HUGE and didn’t make any noise like a flock of geese whatsoever, just that cooing sound. The only thing I could think of was sandhill cranes, but I know nothing about them, so that’s a wild guess. Any ideas? Anyone have a pair of Vortex Crossfire? I'm thinking of buying the 10x42. Where I hunt I just can't justify spending over $200 on binos. Ethics Question: Should a hit count as a kill? An interesting question was posed on Randy Newberg's Hunt Talk Radio podcast: Should a hunter consider his tag filled if he hits/wounds an animal, but is not able to harvest it? Legally, it obviously does not count against the limit, but should the hunter count it? I'm interested to hear what you guys have to say. OK guys I need some advice/reccomendatons. I'm fed up with the generic scopes that came on my last two rifles. The questions is: Is it possible to find a decent scope for $100 or less and if so what brand? Thanks for your help. I'd like to say I found this, but the truth is somewhat different. I wish I had seen both of this deer's antlers in a scope. I posted this a few years back. Grandson Jackson spotted this guy under the backyard feeder one year and wanted me to kill him for a euro mount for his bedroom wall, How do you say no to your youngest grandson. We donated the meat to a local food bank program and they were happy as heck with him. Dressed in the 200 lb range on Uncle Lee's scale, he was being stupid and had his mind on a pretty young doe and forgot to look around that day. When I put a bolt thru both lungs he only ran about 25 yards and fell over in a ditch, it took two of us along with my ATV with winch and a chainsaw to move him 50 Yards to where I could get a strap around his antlers and drag him out. The wife was standing on the deck with 91 dialed on the phone because she just knew I was going to flip that Yamaha over backwards on top of me but we survived. Bored tonight... Anyone have a crazy hunting/Fishing buddy ? I had one I truly believe if I called him up and said George lets go to BFE and hunt camels his reply would be when to we leave and how long to I need to tell the wife we will be gone. Last I heard he had moved to Arizona tho. One of the story's went like this. I had set up a Canadian bear hunt he wanted to go on but didn't have the needed deposit at the time. I told him no problem I will just send in both of ours and you can pay me whenever. I got a call a few weeks later that they were catching big bluegill out of a marsh on a F&W area he lived nearby. So off I go to meet up with him and catch myself a bucket full of cold thru the ice bluegill. There was several others that had got the word on that hotspot. As we are sitting there he says in loud enough voice the other guys around us could clearly hear. I bet you $600 I catch a fish before you do and I said OK knowing he was just messing with those other guys. Just a couple seconds later I pulled up a large bluegill thru the hole. Old George walks over and peals off 6 100 bills and hand them to me making sure those other guys seen it. Those guys went nuts, one to the other they were saying did you just see that guy lose $600 on a bet on the next fish. Him or me never told the other guys it was a joke and about the hunt deposit deal. When did you start your kids hunting? Yesterday I had a small catch circle with a trap full of grass. Reset and rebaited and had this female this morning. Can someone tell me how difficult it is and approximate cost per acre to clear cut mature timber and get it to tillable type ground? I've got a couple areas that I would really like to open up for food plots. U.S.A. -(Ammoland.com)- On 11 November 2018, on Sunday morning, Anders Broste was hunting with a friend. He had already harvested his deer, weeks earlier. He had an elk tag, so he had his rifle along in case he was fortunate enough to encounter an elk. He knew there were plenty of deer in the area. Broste was using two hands to move through heavy brush and alders. His friend was about a hundred and fifty yards away. It is a common and successful hunting technique. Broste saw the bear as it lifted its head from its bed. Then, the bear charged. Broste had his rifle slung. It was not in his hands and at the ready. He tried to get the rifle off of his shoulder. He was only able to interpose it partly between the bear and his body before the bear was on him. Broste said he did not have a plan for a bear attack. He said it was mere seconds from the time he saw the bear until it was on him. A practiced rifle shot, with a rifle in his hands, can hit a close, moving target in less than a second and a half, if he is ready. anyone know of a place in ky to get a bear hide tanned? thinking about buying a new pair of boots. Lacrosse is having a sale. Anyone have experience with Alphaburley Pro? Should I go with 800 gram or 1600? Price difference isn’t much. I deer hunt in Kentucky and Illinois from October - January. Thanks for advice. Reagan has had an absolute Awesome season! 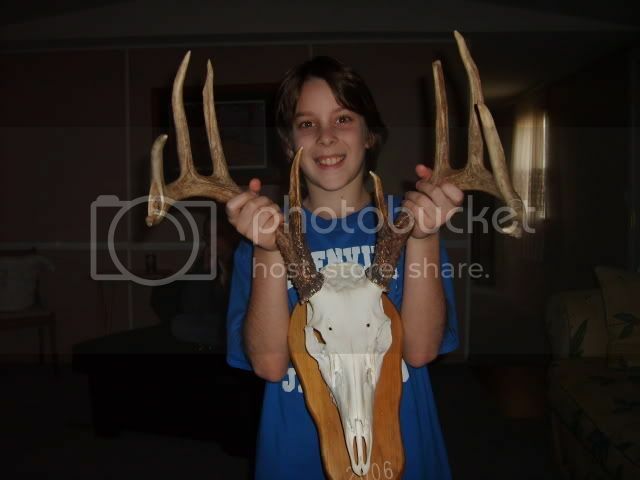 She killed her 1st deer, a doe with her .223, this past youth season. Then she killed her 1st Buck, with her sister's 7mm-08, Sunday on the 2nd day of Gun Season. I got a cool pic on trail cam! First off these pics have been saved over the years. All from public forums, mostly this one. so none taken off private facebook pages or anything. New Edition of THE OLD PRO TURKEY HUNTER by Gene Nunnery! There is a new edition of THE OLD PRO TURKEY HUNTER! The cover is different and there is a new forward, but the contents are still the same. Or visit our eBay store, Gene Nunnery Old Pro Products, for the book and other items. The book is $25, plus $7.99 for shipping. where are the leafs when one needs them.... in the woods of course! I guess to get hit by my Chevy pickup..hit one today 5 minutes from the house..pretty good size bear..didn't kill it, but I bet he will have a headache..
through reading about the fatal grizzly attack that the bowhunter and guide had..my god how awful! I feel terrible for the guides family and also for the bowhunter. I have to say that it was awful odd that the sow reacted the way she did, you would think that if one was going to do so something in that manner, there would be a valid reason such as protecting a cub or a kill. I have to say that I think dept of fish and game did the right thing by dispatching both animals, and I can't blame the bowhunter for his reaction..its easy for someone to call him a coward for running away but honestly if it was me I can't say what my reaction would be as I have never had to deal with such a dangerous situation...I'm sure when something that crazy is going on its hard to get your mind to work right. For some reason I think back to Timothy Treadwell and his girlfriend. Amy hugenot. But as you all know they were told to leave. Or suffer the consequences and they did . Such a tragic story to what should have been a great elk hunt..
Didn’t have scales to weigh it, maybe green britches will weigh it when they come look at it. Was over 6’ from back feet to tip of its nose in length. I haven’t got past the cracking and picking out pieces until you’re blue in the face part yet. Anybody got any tricks to make getting the meat easier to remove from the shells? whats all seasons hunters number? Has anyone had any luck this year at Pennyrile? I live down in Alabama and I'm heading up that way towards the end of the month. Just curious how the hunting has been. I know the Quota hunt was this past weekend but I can't seem to find any information on the deer harvest results. This will be my son’s last Eastern KY Youth waterfowl hunt. They got after’em pretty good! We were loaded up and leaving at 8:15am. I was able to get my first public land buck at Ft. Knox this evening. Not monster but a trophy in my books and a extra buck tag. Both g2’s are bladed in the back. Morning arrived too soon (as expected) and off we went to a field Frank had scoped for geese the day before. The plan called for shooting both graylag and pinkfoot geese. The greylags are mostly local birds.